It is a great pleasure and honor to visit the Harold Washington City College of Chicago and share with you China’s development and reform as well as its contribution to the world. It is my hope that you can get a better understanding of China and China’s diplomacy from my speech. To start with, let’s go back through the history of China’s development. China has made significant contribution to the human society throughout history with its splendid civilization that has extended for five thousand years. In ancient times, China was for long the world leader in agriculture, and contributed to human progress with extraordinary development achievements. Studies reveal that until the mid-19th century, China’s GDP and per capita GDP were the world’s highest. Before the 16th century, China contributed 173 of the world’s top 300 innovations and discoveries. So the question is: why does China contribute less to the world in modern times than it did back in history? According to Deng Xiaoping, this has something to do with foreign powers’ century-long invasion of China following the Opium War as well as the corruption of reactionary governments in China’s history. Repeated invasions by foreign powers, particularly from the West, from 1840 to 1949, and China’s corrupt ruling class and backward social system reduced China to a semi-colonial and semi-feudal society. There was constant warfare, an unstable society, economic depression, no security of livelihood, and extreme poverty. The founding of the People’s Republic of China (PRC) in 1949 ushered in a new era for China’s development. 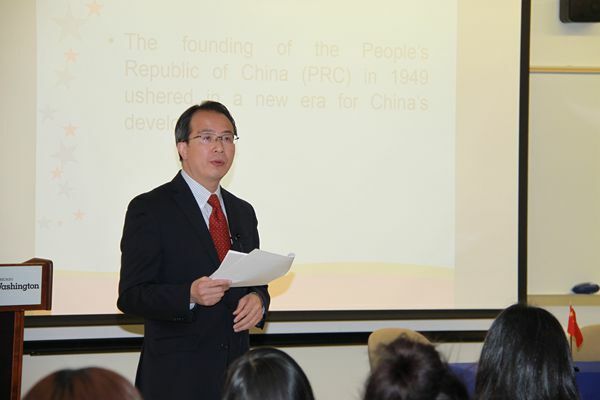 The PRC has provided full development opportunities and conditions to the people, and vast scope to realize that right. Through more than 60 years of effort, China’s overall national strength has greatly increased; standards of living have achieved a historical leap from poverty to moderate prosperity; the people’s right to development in economy, politics, culture, society and environment has been effectively protected. In 2016, China’s GDP exceeded 11 trillion dollars, second only to the US. China feeds more than 20 percent of the world’s population with less than 10 percent of the world’s arable land. Through more than 30 years of reform and opening-up, China has lifted 700 million people out of poverty, accounting for more than 70 percent of the global reduction in poverty. China has established the world’s largest social security system, and average life expectancy had grown from 35 years in 1949 to 76.34 years in 2015, ranking high among the developing countries. The level of education has soared: in 1949, more than 80 percent of the national population was illiterate, and the enrollment rate of school-age children was only 20 percent. In 2015, net enrollment rates were as follows: primary school-age children – 99.88 percent; nine-year compulsory education – 93 percent; high school – 87 percent. The enrollment rate for higher education has reached a level approaching that of medium-developed countries. According to the “China National Human Development Report 2016” released by the United Nations, China’s Human Development Index (HDI) in 2014 ranked 90th among 188 countries, already in the high human development group. What role will a developed China play in the world? China has made a strategic choice to play a greater role in upholding world peace, prosperity and stability and make greater contribution to the world. First, China is committed to injecting strong impetus to global economic growth.